Brussels is the capital, combining two cultures - French and Flemish. Above all, this European capital is home to a multi national diversity. Not surprisingly, Brussels has a seat of the European Union. 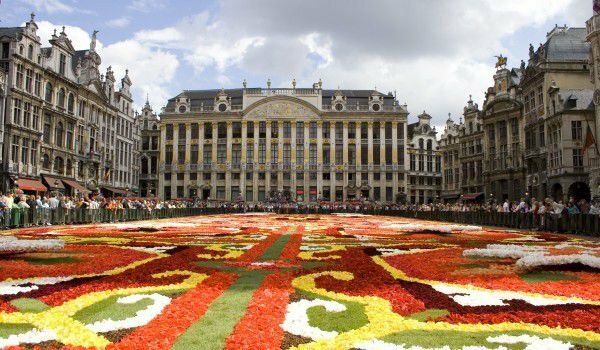 This is the largest city and economic, cultural, political capital of Belgium. Known as the city of lace, the Belgian capital is memorable with its exceptional cuisine, best restaurants and incredibly huge variety of beer. Nearly 600 types of beer, market many different variations in the form of light, dark and red beer. Brussels is actually situated on the Seine river. In the urban landscape of the capital, however, you will not see it because it is covered over by Belgian engineers, led by Henry Moe urbanizing during the second half of the 19th century. The whole community of Brussels is made up of three parts: a large North, Central and South. In the northern part of Brussels includes the Laeken district, where there are several royal residences. Laeken in 1921 became an independent municipality. The historic city is the core of a pentagon of boulevards, built at the former defense facilities. The history of Brussels starts from the 6th century when the town was founded by Saint Gorik. For the first time in historical texts about Brussels , the name Bruocsella is mentioned until the 996th in the diploma of Otho the Great. From 977 to 979 years Carl of France decided to build a fortress and a chapel on the island of the Seine River, which laid the foundations of the city. In the 11th century, in Brussels was built and the first city wall. Later, during the War of the Spanish Succession (1701-1714) Southern Netherlands with Brussels fall into the hands of representatives from Austria Hasburgite. In 1789 with the help of the uprising of Brabant, Brussels for a short time gained independence from management Habsburgs. A little later the French rulers were defeated in 1815 after the defeat of Napoleon at the Battle of Waterloo, which was located 15 km south of Brussels. Congress of Vienna in 1814-1815 decided to unite the South with the Northern Netherlands in the management of William I. After the rise in the era of industrialization in the 19th century, Brussels is becoming an increasingly attractive and well regulated place to live and work. The population is growing rapidly, not least on behalf of immigrants from Wallonia and France. At this time in Brussels buildings were erected such as the Palace of Justice, the Brussels Stock Exchange, Royal Palace, the Arc de Triomphe and the famous buildings in the Art Nouveau style. After World War II Brussels gained the increasing international importance: in 1958, staying there is the European Economic Community (forerunner of the European Union). In the same year in Brussels the World Exhibition takes place. In 1967, from Paris to Brussels the NATO moves. 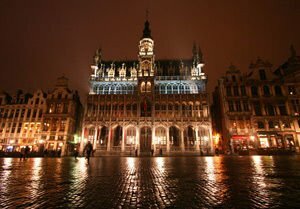 In the center of Brussels is a beautiful square, Grand Place. There are wonderful architectural masterpieces as well as many of the best institutions that can offer the Belgian capital of its residents and guests. In Brussels the Art Nouveau style of 19th -20th centuries, with typical floral can be seen almost everywhere in the old part of town. Father of Belgian Art Nouveau was Victor Horta. In Brussels you can visit his home and his studio, which are now converted into the Museum Horta. The museum is open from 14:00 pm to 17:30 pm. The museum inside is impressive with its design, which is composed mainly of marble with iron supports. The place du Jeu de Balle is one of the oldest squares in Brussels. The Flea market here can offer a wide range of absolutely everything you can imagine. There are objects from Africa, South America, counterfeits of famous masters, and around the square are antique shops and pretty and nice cafes and restaurants. The place du Petit Sablon in Brussels is a small and picturesque park, located next to the imposing Gothic church. Here you can indulge in a minute break and then continue the tour of the places in the Belgian capital.